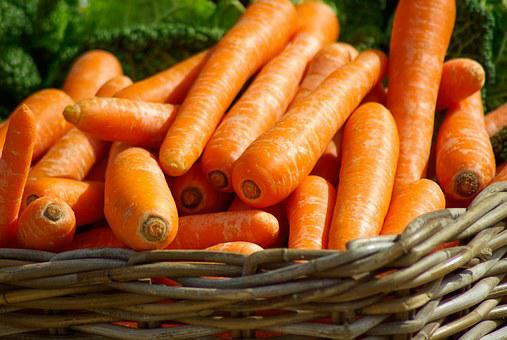 Low in fat, cholesterol free and low in sodium carrots make for a wonderful snack and healthy addition to meals. Salads can easily be garnished with carrot strips made by pealing clean dry carrots with a potato peeler. If you place the carrot strips in the microwave for 30 seconds with a tablespoon of water you can easily curl the strips for added flair. This is a wonderful way to introduce carrots to young children. While buying carrots search for carrots that are bright orange to orange-red in colour. The tops should be a rich dark green with no yellowing around the edges. Once home trim the green shirts then rinse and drain the carrots and store in a large sealed plastic bag. Carrots will keep in the vegetable drawer of the fridge for up to three weeks. When the carrots start to become limp they are getting old and should be used immediately or replaced with fresh carrots.